Contractors have a variety of options for setting up top-notch training programs. This feature follows Ron Smith’s three-part series on how to set up an effective training program. Writer Peter Strozniak interviewed contractors, manufacturers, and distributors to report on further details of how they are setting up effective training programs. Andy Stack remembers the day he was filmed practicing a sales pitch in his company’s in-house training center. When the video was played back, Stack cringed. But he learned something valuable from that awkward experience. Using a video camera to help his 15 full-time employees develop better sales techniques and customer-relations skills is just one function of a new training center that Stack opened in the fall of 2005. The company’s 1,000-square-foot center is filled with all types of heating and cooling equipment to also provide continuous hands-on technical training. Some of the equipment includes two steam boilers, two hot-water boilers, a forced-air furnace, heat pumps, air conditioning units, and a radiant floor-heating system. The steam boilers are hooked up to working radiators. The equipment is used to challenge trainees with “real-world” problems. While there are different ways to do training, the big benefit of operating an in-house training center, Stack said, is that technicians can put their hands on the equipment at almost any time and learn at their own pace. “Our guys like to work with their hands, so they learn better by doing,” Stack said. “You can talk and teach all you want, but there’s no substitute for hands-on training. The heating and cooling equipment shows technicians how each piece of equipment works. When they do the hands-on training, it gives them the experience they need to help them meet the challenges they will face in the field.” Stack’s son, Brian, oversees the training program. Training sessions usually focus on repair and replacement work. After each training session, technicians have to demonstrate that they can do the repair or replacement work. Although training sessions are held twice a week, technicians are allowed to use the center at anytime. Nevertheless, other hvacr business owners have successfully used outside resources such as community colleges, universities, consultants, and certification organizations such as NATE, North American Technician Excellence. “NATE is the only certification in the hvacr industry that says your technicians know what they’re doing,” said Ed Broerman, founder and owner of Ed’s Heating and Cooling in Tipp City, Ohio. In addition to NATE certification, Broerman says, his technicians are required to complete 45 hours in training annually, much of which is done through the local technical or vocational school or a consultant. His company spends about $1,500 in training per technician each year. Broerman also mails a self-addressed, stamped postcard survey to customers each quarter to monitor their satisfaction levels. Broerman hires a consultant to train his technicians in customer relations to learn how to look into the client’s eyes, shake hands firmly, and do other little things that will be remembered, such covering work shoes before entering a customer’s house. While training can improve the technical and customer-relations skills of your workforce, it also can help retain good employees if you make training an important part of your company culture. Read Frymire, second-generation owner of Frymire Services Inc. in Dallas, says his 130-employee company launched its training program in the 1970s. “One of our company mantras is that training is essential, and we tie it to a career-development path for every employee,” Frymire said. “Many of our managers working with us today were with us in the 1970s and went through our first formal training programs.” His company increases its training spend by about 2% to 3% a year. Merging training with career development is important because it provides employees growth opportunities and advancement, which can help reduce labor turnover. More than 31% of Frymire employees have worked at the company for 10 years or more. “We work hard on career development because when technicians or installers reach a certain age, or are growing weary of the physical demands of their jobs, they can go into service, sales, or management,” Frymire said. Many technicians find the switch to sales difficult, but as many as 40% have successfully transitioned, Frymire said. Frymire’s program outlines what type of training, education, and certifications employees need to complete and helps them transition into new fields. In addition, employees are encouraged to work on personal development goals through independent reading to increase their knowledge about a career-related topic, or by joining an organization that can improve their communications skills or style. Frymire employees receive about 32 hours of training every year. What’s more, their training and education activities are part of annual performance reviews. To measure the success of the company’s training, managers review grades employees receive for classes and training sessions, and consider anecdotal evidence from customers. “Training is difficult to measure empirically, but it boils down to the fact that I sleep better at night knowing my employees are trained,” Frymire said. For hvacr business owners who cannot devote resources for an employee-training program, there are other options. 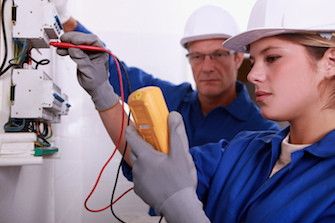 Equipment manufacturers and some hvacr distributors offer technical training, some of it free. For instance, over the last two years, Mitsubishi Electric HVAC has increased its number of training centers from one to three. Based in Suwannee, Ga., where the company operates a training center, Mitsubishi also opened a training center in Dallas in 2005 and another in Chicago last year. A fourth training center is in the plans for the West Coast. Mitsubishi offers all of its training free because it’s another way for the company to sell its air conditioning and heating equipment, says Ken Brown, Mitsubishi’s division training manager. Apparently, this strategy is working. The company declined to provide sales figures, but says its market share in North America is growing. In addition, since Mitsubishi Electric HVAC was established in 1984 in North America, it has expanded to new markets such as Latin America, Bermuda, and the Caribbean. Mitsubishi offers about 100 training courses, as well as customized training classes for hvacr businesses. Distributors also provide training for hvacr businesses. Some of the training is offered free depending on how much equipment you buy from the distributor. HVAC Distributors of Mount Joy, Pa., which employs 72, holds four to six training sessions annually for contractors that buy high volumes of equipment, and one training session for contractors that buy low volumes. In addition to its in-house training center, HVAC Distributors offers mobile training sessions in which the training is held at the contractor’s site. Like Mitsubishi, HVAC Distributors believes that better-trained technicians and installers can help drive sales. And what drives the success of a training program for HVAC Distributors is the quality of the trainers. Melniczek says his company’s investment in providing training for contractors increases annually by 1%, or $300,000, based on its annual revenues. To make sure you’re providing the classes and the instruction that technicians need, it’s important to regularly conduct surveys. After every training session, for example, Melniczek asks technicians to fill out a short survey. Here is a sampling of Web sites for equipment and service providers that offer training.